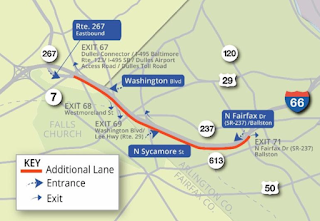 Hey, FABB members and friends in the McLean/Tysons and Falls Church area: the Virginia Department of Transportation (VDOT) is holding a “Pardon Our Dust” meeting to discuss upcoming construction in your part of the county as part of the I-66 Inside the Beltway project. For bikers, the most important part of the project is the plan to build a bridge for the Washington & Old Dominion Trail over Route 29 (Lee Highway) as you leave Falls Church and enter Arlington. The upcoming construction also will add an additional travel lane to I-66 on a four-mile stretch of eastbound I-66 between the Dulles Connector Road and Fairfax Drive (Exit 71) and connect two existing ramps at the I-66 and Route 7 interchange to allow direct access from eastbound I-66 to the West Falls Church Metro Station. Construction is just now getting underway. Please plan to attend and speak up for making the W&OD bridge the best it can be. The meeting will be held on Tuesday, June 5, 2018, from 6:30-8:30 p.m. at the Yorktown High School, 5200 Yorktown Boulevard, in Arlington.